When it comes to making it big, Sounds Like A Storm definitely have what it takes... and I think they know it, as well; with confidence and rock n' roll swagger aplenty, as well as a steely determination to bring their powerful and emphatic music to the masses, this quartet of Leeds based teenagers (Sennen Ludman, Joseph Schofield, Cormac Connelly and Connor Passey) are already hitting all of the right notes. 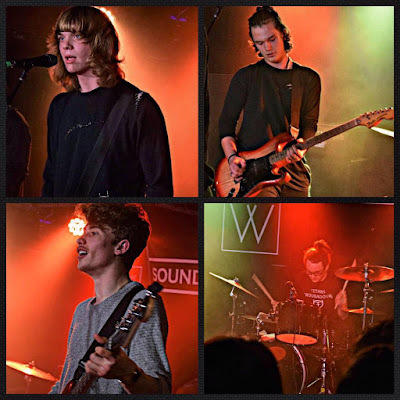 Despite only having been together just under a year, their tight-knit and exceedingly polished rock styling has won them a legion of fans in and around Leeds, all of whom were out in force for their near sold out headline show at The Wardrobe. Every single song within their set packed some serious punch and has the potential to be a successful single release, showing off not only their musical abilities but also their extraordinary combined chemistry as a band. Frontman Sennens' searingly vehement vocals, accompanied by fervid guitars and an all around audacious instrumental vim made for an exceedingly trenchant and rhythmically pulsing performance. From the word go, the excitement and energy throughout the crowd was at fever pitch, with people singing, dancing and even crowd surfing from the second the band set foot on the stage. They performed with such an easy confidence, displaying authentic showmanship and appearing jubilant and completely at home on stage. For such a new band (not to mention one so young) to inspire such an intense reaction and loyalty from their audience is nothing short of astounding. One thing's for sure... this is but the tip of the iceberg. Watch this space, because Sounds Like A Storm are here to stay. Excellent review. Swagger aplenty.get better with every gig. Gonna sell out some big venues.